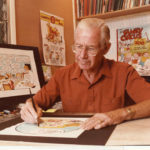 William Aloysius Keane better known as Bil Keane, was an American cartoonist most notable for his work on the newspaper comic The Family Circus. It began in 1960 and continues in syndication, drawn by his son Jeff Keane. "A hug is like a boomerang – you get it back right away." "We are, in the comics, the last frontier of good, wholesome family humor and entertainment."